« Did you make that? Compliment or not? Hi! 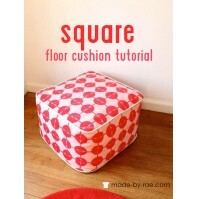 Stephanie from Swoodson Says again, sharing a round-up of one of my very favorite things to sew. 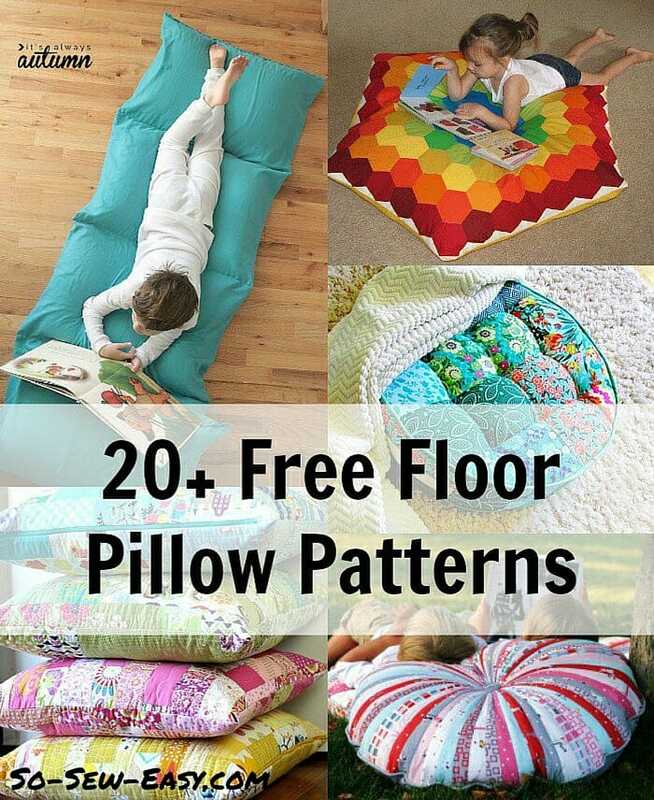 Floor pillows are easy to make but make a big impact – the down side is once you sew one, all your friends will be begging you to make them one too! We pull them out for reading books, watching movies, and sometimes I even use them when I'm working on hand sewing projects or embroidery. 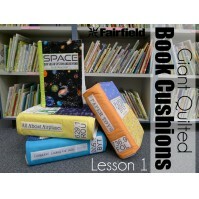 There are all types of tutorials in the round-up, from simple to complex and quilted, with a few fun animal shapes snuck in. 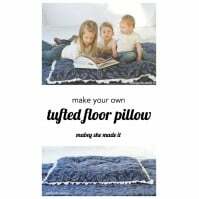 If you're a fan of quilting or animal, you will want to see the patchwork hexie turtle floor pillow I made for my son too! 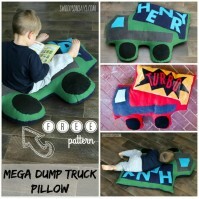 Floor pillow are a great way to showcase a large scale print, use up scraps, or personalize with a kid's favorite colors and characters! 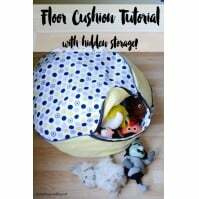 One of my best tricks is to shred up fabric and use it in addition to regular stuffing, it keeps fabric out of the trash (more tips on how to use up scraps in this post) and gives floor pillows a nice weight too. 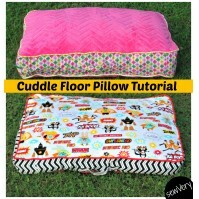 Other options to consider as you look through tutorials is how they close – I like using an invisible zipper on floor pillows and beanbags so I can take all the stuffing out easily wash it if I need to, instead of seam ripping. 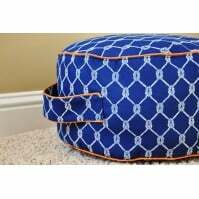 One of my favorite ways to jazz up a pillow is to use piping around the edges, it makes pillows look really crisp and professional. If you have never used piping before, Deby shared a tutorial here for how to sew with it and also how to make it. 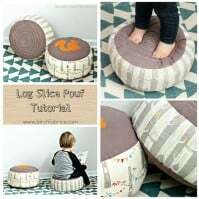 In addition to her overlapping method, you can also mesh the cording ends and sew over it for a straight join instead of the curve in her tutorial; I share that method in a free arrow pillow tutorial I made for Birch fabrics. Thanks for the patterns! 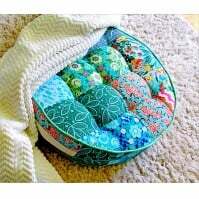 I love the tufted floor pillow, the round turquoise patchwork one. I have been seeing the picture of it online for the last two years, but unfortunately, the link never works to any further info or tutorial. Same for the link here, unfortunately. “That page does not exist”. Hi Patty, try the link again. It should be working now. Thanks for letting me know. I’m not sure how this happens but amazing luck. 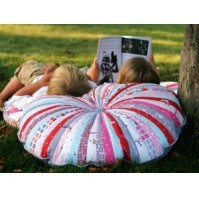 I was just planning to make some sort of floor pillows for my kids now that the weather is warming up a bit. The timing is perfect. Thanks for this roundup! What a great round up. 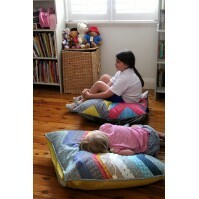 There are so many great floor pillows here! 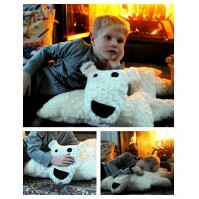 Thanks for including my Polar Bear Pillow!